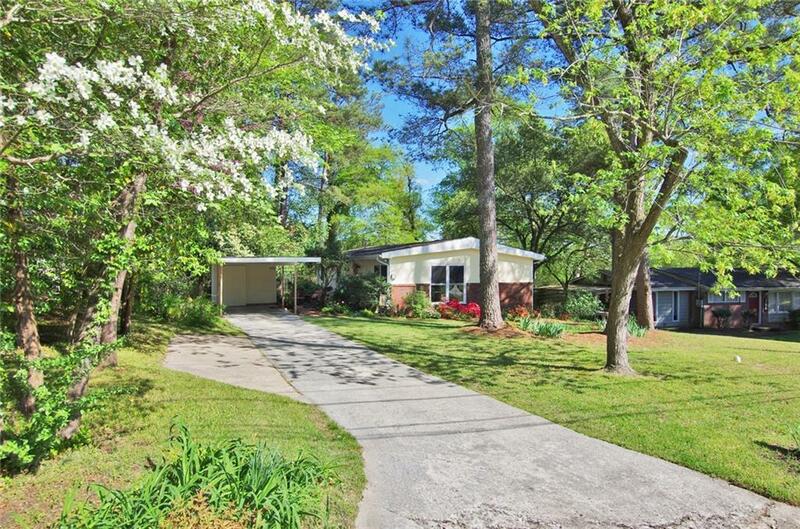 Beautiful Mid Century Charmer on GORGEOUS landscaped lot. Hardwoods and amazing vaulted wood ceilings throughout. Separate Living and Dining Rooms, Large Kitchen with White cabinets and appliances, Pantry and Laundry Room. Master in Rear of Home with ensuite Full Bath. Two secondary Bedrooms, great for guest room and separate office. Lots of closets and storage, second full bath in hallway. Covered carport and extra storage room. Lush patio with space for seating, additional space for entertaining. Close to shopping and restaurants. Directions: From I85 North To Chamblee Tucker, Exit To The Left. Turn Left On Stratford Arms Drive, Then Left On Laventure, Follow To 3185 On The Left.